How Many Russians Are Fighting In Ukraine? KIEV, Ukraine -- Western arguments about how to counter President Vladimir Putin's support for east Ukraine separatists are leading to clashes over the question of how deeply involved Russia's military is in the conflict. 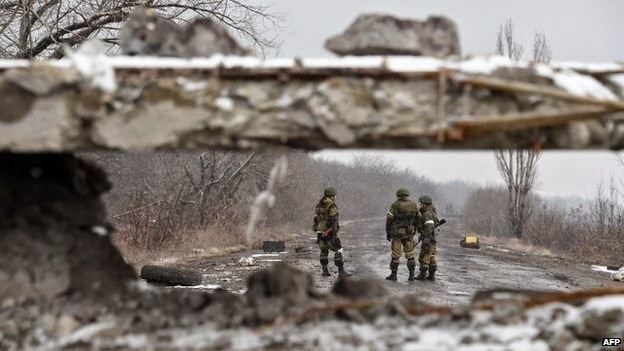 Pro-Russian separatist fighters have captured Debaltseve. The latest salvo between NATO allies came in a German government briefing to Spiegel magazine that accuses the alliance's supreme commander (American Gen Philip Breedlove) of disseminating "dangerous propaganda" on the extent of Russian military involvement, trying to undermine a diplomatic solution to the war. The Kremlin has denied its forces are directly involved in combat, but the latest estimate by US Lt Gen Ben Hodges, commander of the US Army in Europe, says 12,000 Russian troops are operating inside the neighbouring country. As the conflict there has worn, on this intervention has become increasingly hard to hide, growing bigger, with more advanced weapons, and capturing more territory for the nominal "separatist army". information released by the US and its NATO allies. For those distrustful of the Pentagon or Western intelligence agencies, you can set their information entirely aside. Indeed, there may be some reasons (such as not wanting the diplomatic damage involved in directly labelling the Russian moves an invasion) why Western leaders may have held back when describing the Kremlin's action. Sustaining the operation in Ukraine and on its borders has, however, required the mobilisation of units across the breadth of Russia, according to a new assessment by Dr Igor Sutyagin, of the Royal United Services Institute. He believes 90,000 troops were required in late 2014 to provide deployments around Ukraine, inside its eastern (rebel held) districts and in Crimea. This effort has been so great, he argues, that, "it is obvious that there insufficient resources... to sustain military operations at the current level for over a year". A journalist from the Russian newspaper Kommersant met several young Russian soldiers in Debaltseve who told him they had come from the same mechanised infantry unit after commanders appealed for volunteers. "Their commanders did not oppose their going," the journalist reported, "on the contrary, they welcomed their enthusiasm, explaining to the soldiers why it was necessary for them to go to those very areas to protect their homeland." Another Russian paper, Novaya Gazeta, interviewed a badly burned tank crewman in Donetsk hospital who said he had been serving with the 5th Independent Tank Brigade in Siberia when ordered on "exercises", which all the soldiers involved had understood meant they were deploying to eastern Ukraine. Since last August, when the scale of this increased considerably, the Russian Soldiers' Mothers Committee and other human rights groups have published details of dead soldiers being returned for burial in Russia. Open Russia, a group funded by Kremlin opponent Mikhail Khodorkovsky, has compiled evidence of 276 Russian soldiers killed there up to late January. Dr Sutyagin says this is a considerable underestimate and the total is nearer to 800. During the August fighting, entire Russian units were sent across, a necessity perhaps in view of the crisis faced by separatist forces, but one that produced some tell-tale evidence. Ten paratroopers from the 331st Guards Airborne Regiment, usually based at Kostroma in Russia, for example, were captured together by the Ukrainian military inside their country. And in Pskov, home of another airborne unit, several corpses were returned together for burial. When Russian forces drew down a couple of months later, I was told by a senior NATO official that as few as 1,000 remained in eastern Ukraine. It was then, evidence suggests, that the Russian army determined a change in the way it would use force across the border, forming composite units of volunteers that would be exercised together so they attained the necessary military slickness, but would come from a variety of garrisons and units so their identity would be harder to prove. There could be another reason for the use of smaller detachments from far flung units across Russia. Dr Sutyagin says it "appears to indicate a shortage of badly needed manpower". Recent Russian reporting makes clear the direct involvement of its combat troops in February's battle for Debaltsevo, something NATO did not even allege at the time. Indeed much of the NATO or US analysis, however critical German backers of a diplomatic solution may have been of it, may have erred on the side of conservatism. At a meeting with journalists in London last month, for example, the US ambassador to NATO, Doug Lute, said the Russian military had committed specialists to help crew advanced weapons such as anti-aircraft missiles or electronic warfare gear, and "an alternative chain of command". That Russian officers are providing the brains as well as co-ordination behind the Donetsk and Luhansk separatist forces became clearer last November, when Lt Gen Alexander Lentsov, deputy commander of Moscow's ground forces, appeared in eastern Ukraine. He has subsequently been appointed to the committee trying to uphold the latest ceasefire. As for whether this command structure was actually relying on Russian combat units, Lt Gen Lute would not go that far, saying the Russian military in the east of Ukraine was "not a force in the sense of being an entity". But reporting from the Russian side of the front suggests that during the fight for Debaltseve, Lt Gen Lentsov won the battle with three battalion groups made up almost entirely of troops originally from units across the border in Russia. In the Novaya Gazeta interview with wounded tank man Dorzhi Batomunkuev, he said his group, from the 5th Tank Brigade, had been combined with detachments of men from other Russian army combat units during three months of training at a camp near Kuzminsky, close to the Ukrainian border. The battalion, equipped with 31 T72 tanks, had crossed into Ukraine early in February before taking part in the Debaltseve battle. The men who had actually joined locally, in the breakaway areas of eastern Ukraine, had made up less than 10% of the unit, he said. Other reports suggest the local men, as well as some Cossack volunteers from Russia, make up the public face of the separatist forces, manning checkpoints and so on, while the composite Russian army units, equipped with the latest tanks and artillery, are employed for offensive action. Of course trying to differentiate between these forces (genuine locals, Russians who have come individually to fight alongside them, and trained units of serving Russian army soldiers) is not easy for reporters on the ground - or even it seems for NATO countries with their considerable intelligence resources. Lt Gen Lute, for example, noted late last month the presence of "hundreds" of Russian army troops in Ukraine. Now, Lt Gen Hodges has raised that figure to thousands. "If you don't believe Russia is directly involved in Ukraine now, you'll never believe it," he said. Did the US assessment change dramatically in less than a fortnight? But it's also the case that NATO military people I've spoken to have been notably more hawkish on their estimation of the Kremlin role than politicians or diplomats (Lt Gen Lute is something of a hybrid, having previously served as a US Army general and in the White House). US political authorities have also sought to minimise the gap between their public statements and assessments by Germany and others determined to avoid confrontation with Russia. President Barack Obama and his team have long sought to avoid painting themselves into a corner over Ukraine, for example by labelling the Russian action "an invasion", something that might suggest tougher action was needed against President Vladimir Putin. But the odd thing is that the most compelling evidence that his army is bearing the brunt of the fighting against the Ukrainian government is now coming from Russian reporters or the mothers of dead soldiers rather than the West.